Copy the most up to date ASPNETDB.mdf and ASPNETDB_log files up to your server and place them in whatever directory you want . 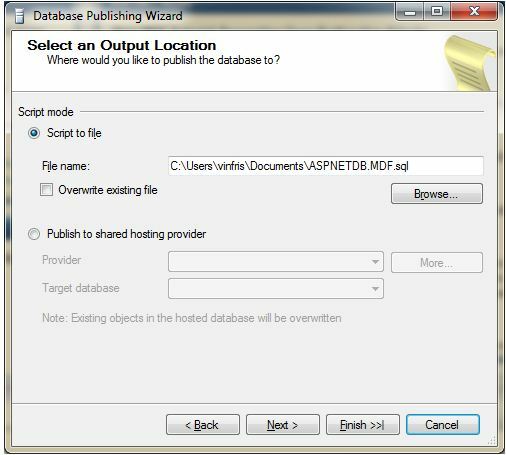 Attach the aspnetdb.mdf file by right clicking on databases and clicking attach. I think by default it names the database with the full path of the database, so I just renamed mine to ASPNETDB. That should be it. I loaded up my ASP.net pages and it functioned like it normally does. 1.) Figure out when to add the subtotal. In my example, when it becomes a new year. I need to insert a subtotal row before it creates a new row. I do this in the Gridview’s RowDataBound. This is where you would normally add totals to the footer. 2.) Use a Function to return a row, and insert that row into the gridview before it writes the next year. Then in my page Load I set them both to the current year. This will make sure that it does not add a row at the beginning of the gridview. Then I needed some global variables to hold my totals and subtotals. Now in The Gridview’s rowdatabound, as it’s reading data from the database, I need to first make sure it’s a data row, then I grab the year from the current row that it is reading from my table, and find out what year it is. 2. Get the index (row) that we are on. We’re not out of the water yet, we not only have to write the subtotal above the footer, and then put our running totals in the footer as well. It can be really frustrating in ASP.NET when you get the timeout expired. By default SQL server allows a 30sec timeout for queries. The problem is that sometimes we have queries that pull large amounts of data on an old server and it is just going to take >30 seconds to execute. For instance, I have a few reports that I created for the end of the year that have to crunch a years worth of data that can take a long time. Other thing is if you’re using a Sqldatasource there is no great way to increase the timeout. This is a simple way to use codebehind to populate your gridview while giving you the flexibility to increase the timeout to whatever you want. Timeout expired. The timeout period elapsed prior to completion of the operation or the server is not responding. Then create your SQL String like you normally would. Then add the following obviously substituting your information. Another reason that this error may happen, according to MS, is that there are uncommitted transactions in the database. Here’s some more information on the topic. here’s a quick one. I created a web page with 2 textboxes, called them textbox1 and textbox2. The problem was that when i tabbed from the first one to the second one it would jump somewhere else on the page. I’ve created pages in the past, but it always just worked correctly in all browsers. It could have been because I added textbox2 after, but I’ve inserted controls in between 2 controls and the tab index has worked automatically. I went about and set the tabindex property of the control to 0 and 1 respectively. It still didn’t work. So after getting frustrated i tried setting them to 1 and 2 (instead of 0 and 1) and it worked perfectly. Hope this helps someone out. Recently I was developing an ASP.NET site which worked fine on my computer, but when I went to deploy it to Network Solutions, it did not work, and their Support was not very helpful. They told me that membership could not be used. They also told me that asp.net, while supported, could not be used on the server since it is shared hosting environment. 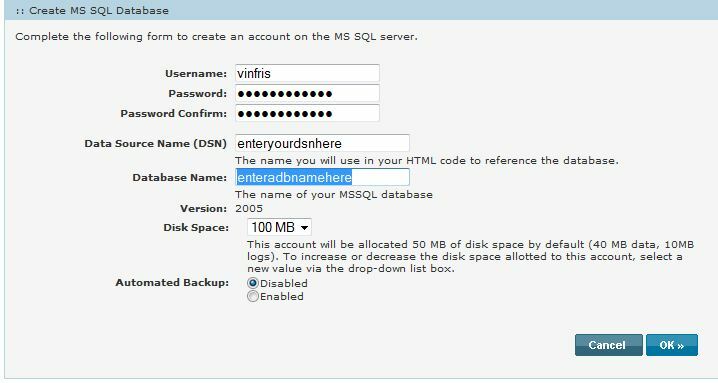 Further they told me that they could not create an “Application” like I would using IIS also because it is a shared hosting environment. They also do not have an option (in windows) for VPS that would allow full control. All the stuff they told me is basically not true or only partially true. First off in order to get your asp.net site up and running (without membership) all you have to do is copy your aspx files to the root of the htdocs folder that they supply for you. This in itself is an application directory and because of this you can run ASP.NET pages. 1. To start off you should have a site with membership that allows you to login successfully from your local computer. There are plenty of tutorials online that will help you out with this but it’s beyond the scope of this post. 4. Now that we have a DB, lets connect to it using SQL Server Management Studio. Network Solutions gives you the address to which to connect to after you create the database. When you are in database manager , select your newly created database and then click edit to view it. Open SQL Server Management Studio and enter the ip address, your username and password to connect. 5. Now that you are connected, minimize SQL Management Studio, and then open up your website in Visual Studio. We will now we will create the .SQL script to recreate the schema and data on the network solutions database we created above. 6. In Server Explorer, Right Click on aspnetdb.mdf and click “Publish To Provider”, then follow the wizard. This will create a sql script replicating the aspnetdb.mdf database. here’s what my screen looked like. 7. Now that you have the sql script created, open it using your favorite text editor, and then copy all of it’s contents. 8. Go back to SQL Management Studio, Find your database name under databases and (you can see all network solutions databases hosted on that shared server), single click it and then click “New Query”. This will open up a sql window. 9. Paste all the code that you copied in step 7, and execute the script. This should recreate all your user information, roles, security, etc. I did not have any errors when doing this so I can’t really help you out if it doesn’t work. 10. Next modify your web.config file to include a new connection string to point to this new database. Here’s the string that I used in my web.config file. 11. Next ftp all of your files up to Network Solutions server using the Manage Account>>FTP/ContentPublishing provided by them. I use filezilla, it’s easier. I uploaded them to the root of the htdocs folder, and voila everything worked. Another note, Network Solutions support was telling me that If I have an access database (which I do), I need create a new folder called “db” under the HTDocs folder and adjust my code to point to this folder. They said this is due to permissions. This worked flawlessly. I would also like to give credit to this site for information on the Visual Studio schema export. The text, ntext, and image data types cannot be compared or sorted, except when using IS NULL or LIKE operator. I needed to access a SQL 2008 database from my codebehind without a control like a gridview. After scouring the internet I put together the pieces to do so. strSQL = "Select * From Sales"
If you want an explanation of the newer commands, you can Google it or look on MS’s site. For my purposes of creating a data driven web page every once in a while, the nitty gritty is not what I’m concerned about. I just need it to work. If you have an aspx page that uses old asp code now, it actually is not too difficult to convert it over using a few copy and pastes and Find and Replaces.